my little red suitcase: et voila pot holders! Pot holders or pan holders, I never quite know what to call them. I know these ones would let me burn my fingers if I tried to lift a hot pan with these, so I will go with pot holders. I made these in a flurry of inspiration after visiting the beautiful blog of Sanna & Sania. Two Swedish interior design stylists who with their combination of white backgrounds, decorated with colourful crochet, and the occasional happy vintage sheet or wallpaper are ladies after my own heart. Scattered through their blog you will find gorgeous interiors and craft projects and I am their new protege, they may not know this, but I am....! You can see more here and here and here. and oh yes, I did remember where I had some hooks in my house, it's funny how you can see something everyday and not really take it in. I've really enjoyed seeing this bright little pot holder on my table, I know you've seen it quite a few times now! I may make some more like this for christmas presents. They are so easy and quick to do. Well I hope this week has gone well for you, it's nearly the weekend. Our week started amazingly well but rapidy went down hill when the new school transition thing started to kick in. We have had over-whelm and stress already, but we are hanging in there......I guess only time will tell. I would really like to become creative business Mum, who makes things during the day time, while her children are at school! There are quite a few people out there doing this, who have really inspired me. I enjoyed reading Jess Browns interview in this months Mollie makes. A lady who makes beautiful traditional handmade dolls, amongst other things. I've always been inspired by women in business. I think I need to put these articles up on the wall around my craft room! Is there something you've been inspired to do that you really want to do? Sounds a lot like our household. I am STILL trying to set my etsy shop up and running but family life gets hectic. I am trying to be a little less stressy so my kids don't follow my lead! High school has brought new and different stress and having the kids at different schools has added something new in to the mix! Good luck! 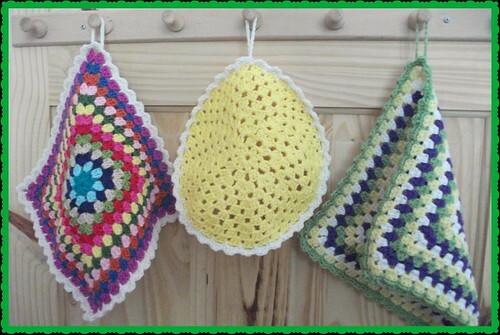 pot holders are always fun to make and to use as a decoration around the home. When I want to croche something but don't really want to get too much busy, pot holders are always my choice! 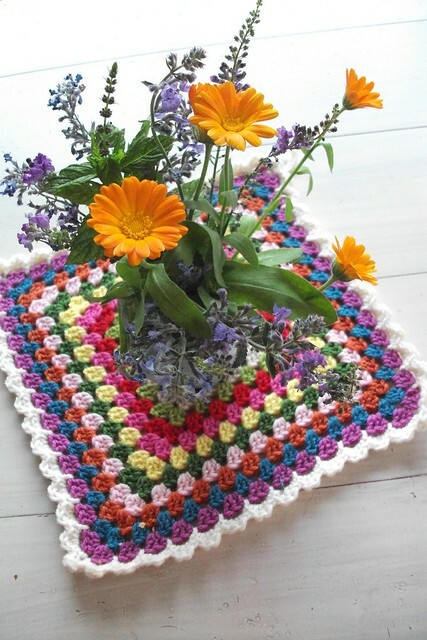 Love the pot holders - how I wish I could crotchet. They look so decorative. Pot holders is what I say....a quick peek around your blog and I'm in love! Those bright cheerful pics...I'm hooked! Hi Heather! In this neck of the woods, they are called "hot pads" as they are designed to place on the table or surface under the pot or pan, and something more substantial (oven mitts?) gets used to handle the heated vessel. I am definatly going to check out all your links posted here. Always happy to find some new fountains of inspiration.